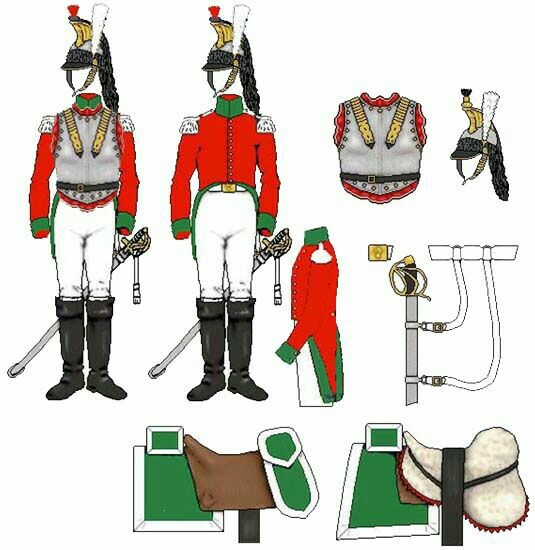 Spain did not have cuirassiers before the Peninsula war, , after failure by the French cavalry , Spain formed its own cuirassiers,the cuirass was seized by the French army.The uniform of Spanish cuirassiers is red coats and green white pants,the clothes is from British so it is red. 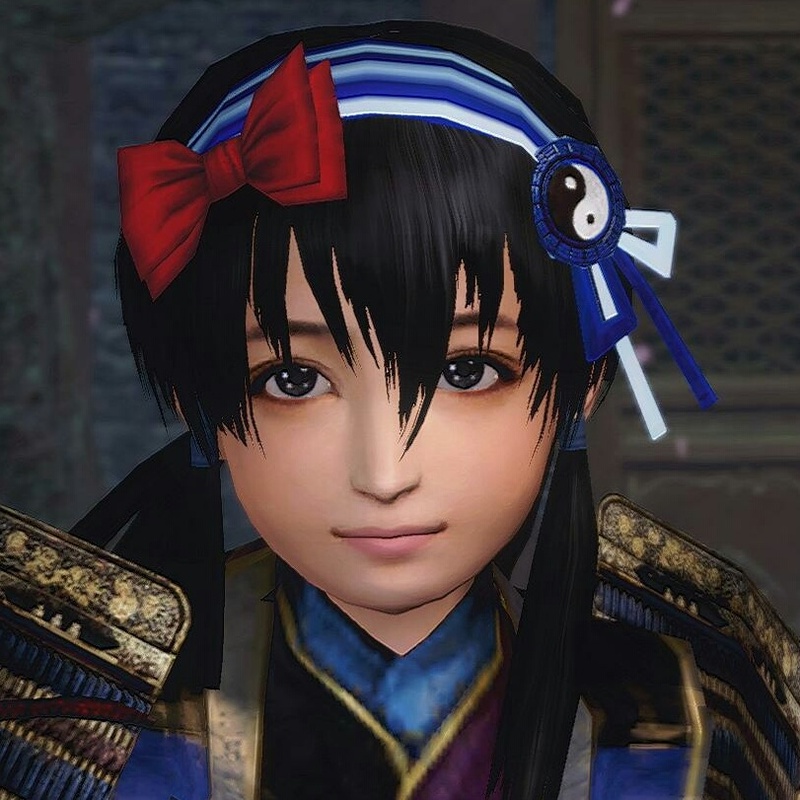 The unit was established in 1810 and is commanded by Colonel Coronel D. Juan Malat. Each of the two squadrons have three companies, a company have 71 soldiers and 60 horses. 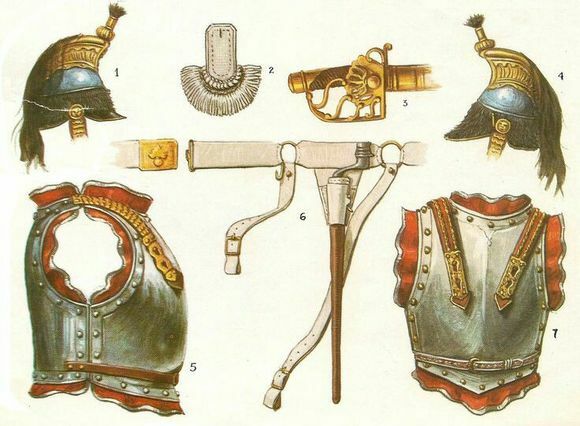 Their cuirass, helmets and weapons were supplied by the Regimiento de Dragones Numancia,they seized this equipments from the French 3º RegimientoProvisional in the Battle of de Mollet. 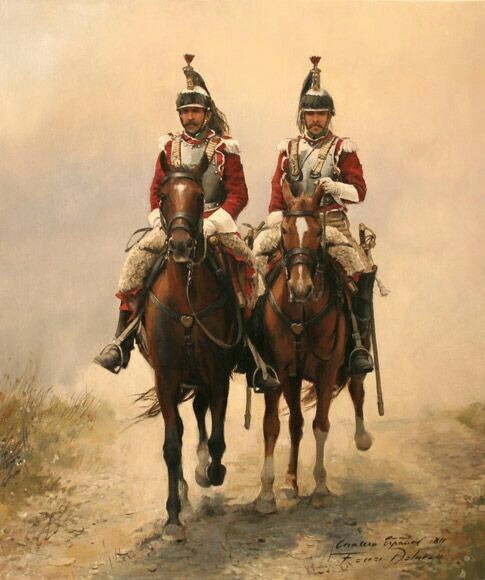 This is an accident, a fact that testifies to the presence of the Spanish cuirassiers.They were founded in Reus on May 24, 1810 -by the command of General O'Donnell, of Earl Rabbis, The cuirass that be seized is equipped to the 1st Pancho of Hásares de Granada. These cuirass came from the French 3º Regimiento Provisional, they were annihilated by the Spanish army on January 21, 1810, in Moliere. 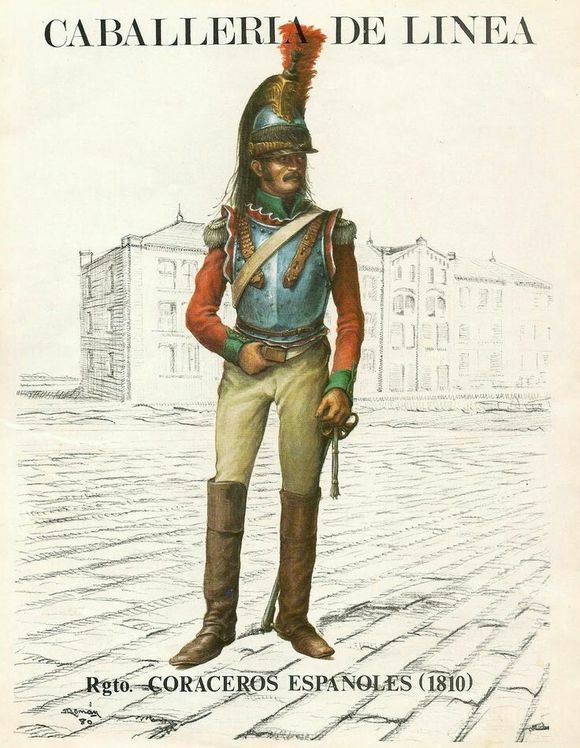 This troop was founded in Poitiers in 1808, it was under the jurisdiction of the Lluhesme column of the military governor in Barcelona until the Spanish war ended.It had 360 cavalries. 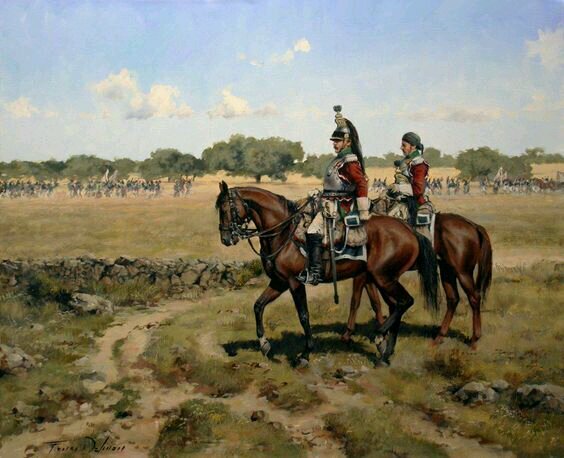 The unit did well on May 26, 1812, when they were sent to confirm the situation of Molins del Rey, they found that the French troops had fortified the bridge.They had charged bravely and broke through an infantry column and captured 200 prisoners. 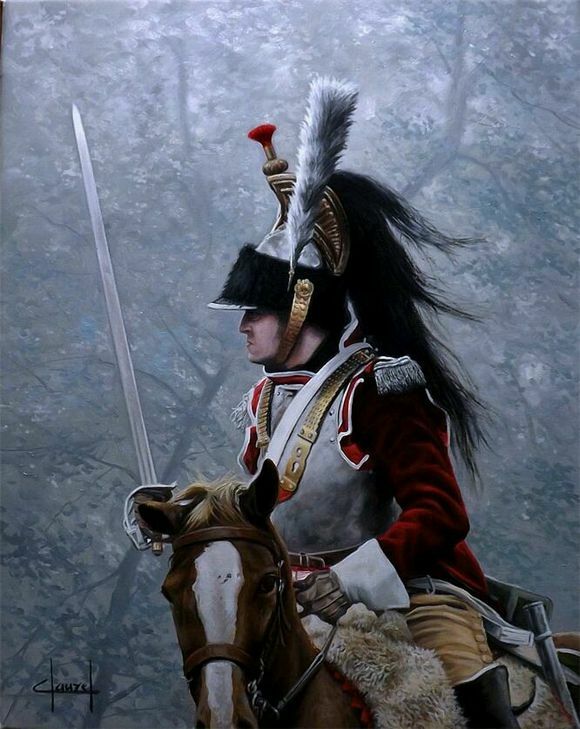 When General Sarsfield came to this regiment to thank them for their feat, their officer shouted: "Coraceros, viva el general！" the general replied, "Victory belongs to Yours, you are still alive. " 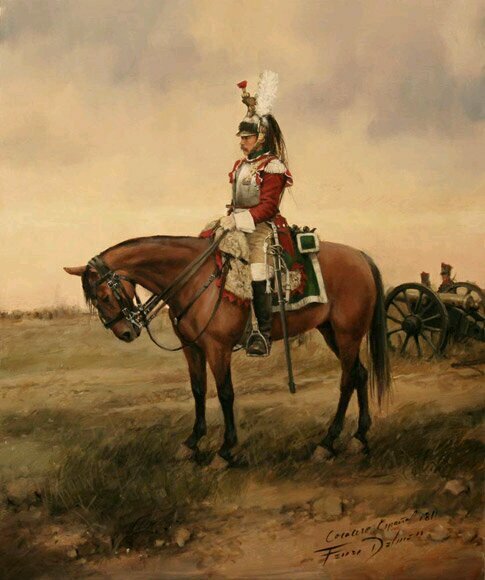 At the end of the Peninsula War, the Spanish Cuirassier had become a squadron that had 210 soldiers and 183 horses.By the ordinance of June 1, 1815, it was upgraded to Regimiento de Coraceros Españoles 3º ,it was added four squadrons that has two companies,and one flanqueadores. This unit was incorporated into the Regimiento de Caballería de la Reina nº 2. in 1818. 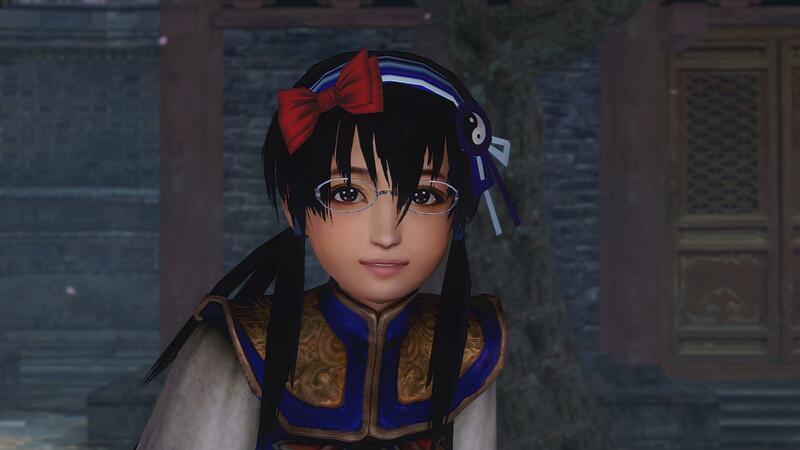 My English is poor ,it is translated from my Chinese article,if you learn Chinsese,you can read the orginial.